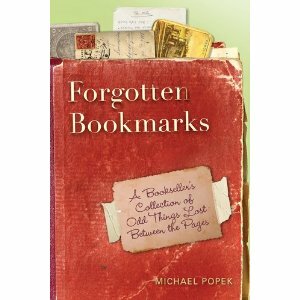 Michael Popek worked at his family’s used bookstore and started to collect and sort the myriad of bookmarks that the previous owners had left in the donated or purchased books. You know grocery lists, letters, pictures, pressed flowers, anything and everything in a moments reach when you have to stop reading but don’t have a bookmark because it’s at the bottom of your bag or underneath your sofa. What a tale these little gems could divulge if they truly could talk. Instead one can get a glimpse into the previous owner’s life and then it is back to one’s life as usual. Things like this just make me smile, I love books and their hidden lives. I especially love the books that creak when you open them, as if entering another world secretly. Where the pages don’t quite align and the paper remains tinted with wisdom from the years of use. The very fingerprints web, connecting us all who have read that same book, together with the story’s thread of truth. I cherish the beauty of sitting and reading while doing nothing else…for hours. The break in reality where nothing but the world between the cover exists; except for the occasional sip of coffee interrupting this endless bliss. Yes, I love the books that creak and know I’m beginning to be more of a rarity as many are moving to the electronic versions of books. I was lamenting on Facebook about the sheer number of books I own, wondering if there is an amount that is considered too much! I ended up deciding it’s like shoes, handbags and dark chocolate; a little indulgence is healthy. I was met by comments about libraries and card catalogs, which only made me smile as I’d love a library in our house. Closing my eyes, I can picture it now in our cozy home: comfy chairs, soft lighting and walls filled with books. My own personal sanctuary, the only thing that would complete it would be an espresso shop in the corner. So far my little girl seems to get lost in books as much as I do, veggies and books. She’s a keeper! Here’s to making our mark on the world, whether forgotten bookmarks, collecting books, or sharing our favorite past time with our children.